Here are my old KS4 Earth Sciences resources. They were made when I worked at Ashfield School quite some time ago now. They are basic but useful for KS4….. 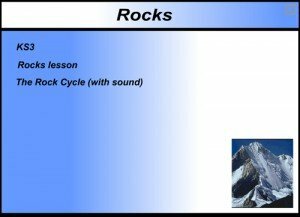 This link gives two animations with worksheets for KS3 Rocks for all the basics with nice examples for each category: Sedimentary, Igneous, Metamorphic and the Rock Cycle.